It’s true! The best laid plans don’t always turn out as expected. As the economy continued to lag three years ago, I put my woodworking business into a state of ‘hibernation’ (see ‘Woodworking and Hibernation’) and invested a considerable amount of time into re-organizing the shop (see ‘Will the Workshop Please Come to Order’), building a new workbench (see ‘Workbenches and Our Work’), doing other income-producing work (I collect field data for property tax assessments in the town where I live and occasionally assist in other towns), and looking forward toward the time when the economy might be more supportive of doing a craft like woodworking. During the fall of 2012, the signs were there: tentative discussions about potential projects with some former clients, increased interest by retail stores in again receiving new items, and a general sense that it was time to start making items again (see ‘Hibernation Ends’). Little did I realize that during this same time frame, my aging (now 90 year old) mother would have to make the transition from nearly independent living to assisted care/nursing home living, and that the process would consume most of my time between travel, making arrangements, and beginning to manage all of her affairs. During the same period of time my wife and I have continued to get nearer and nearer to retirement age (though I have no plans to retire from woodworking for some time!) Approaching retirement age meant that we needed to get serious about finding a piece of land for building a retirement home, and start making plans for that home. Our current home was great for raising kids, both of whom are nearly ‘out of the house,’ but it was never intended to become a retirement home from the time it was first built. After a roughly 6 month search we found a beautiful 16 acre piece of property high up on a hill in Knox, Maine – the same town where my great grandparents and grandparents lived for their entire lives. As we begin to engage in the process of designing a scaled down ‘connected farmstead’ for the property – “Big House, Little House, Back House, Barn (meaning workshop!) we are aware that even though construction is perhaps 1-2 years out, that woodworking time will certainly be limited until the construction is completed and I can begin to re-establish myself in a new location. While I was not able to do as much woodworking last year as I had anticipated and hoped for, I did manage to find some brief times between other concerns to continue to pursue another long-standing interest that uniquely combines music, electronics, design, and woodworking. The project involves a Virtual Pipe Organ (known as a VPO) that has been in various stages of design, testing, construction, and ability to actually be played for several years. 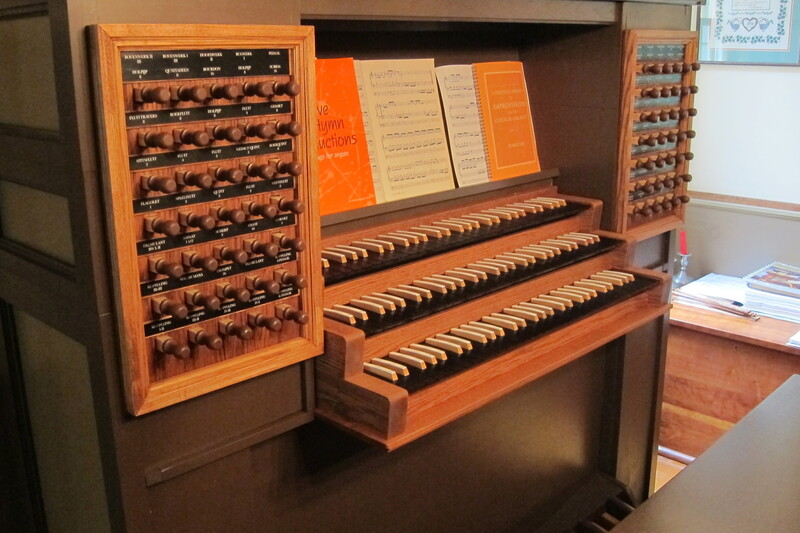 A Virtual Pipe Organ leverages CD (or higher) quality sound samplings of real pipe organs combined with computer technology and an audio system to recreate the sounds of the original organ (often an organ of historic interest.) A VPO is, by nature, a sort of open-ended project with lots of room for exploring the mechanics (keyboards, pedalboards, stop controls, and a case to house them – all of which involve at least some woodworking), electronics (mostly MIDI), and audio systems for the sound. I will be adding a section to this website shortly to post some photos and details of how I reconditioned and ‘midified’ some older pipe organ keyboards, designed and built the stop controls, reconditioned an old pedalboard (recently replaced with a new shop-built one) and built an often-modified case that remains more of a prototype than the finished case I hope to build some day. You can link to my VPO pages here. 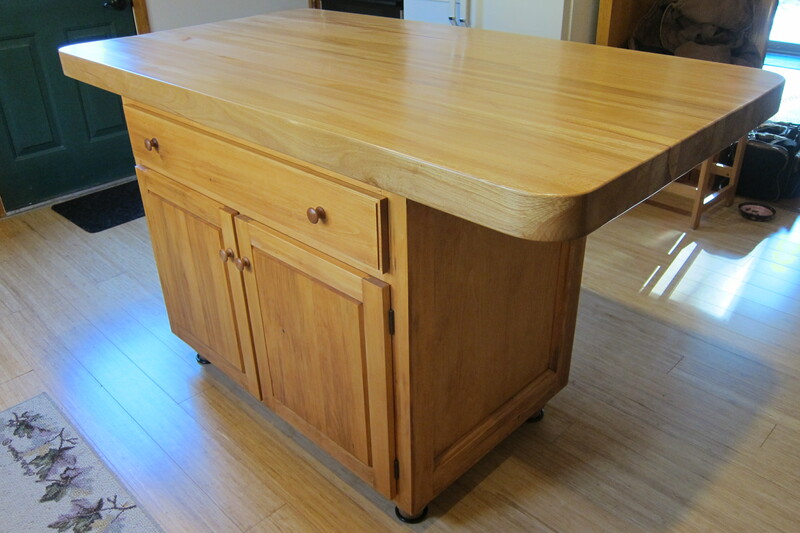 Shaker furniture first caught my attention about 35 years ago with the publication of Thomas Mosers “How To Build Shaker Furniture.” I built a few items from that book for my own use. Since then I have accumulated perhaps two dozen books on Shaker furniture. Not all of the items depicted are good, but many are outstanding and have taught me much about the essential elements of furniture design. 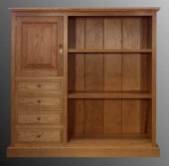 Shaker furniture is helpful in learning about design because it usually leans heavily toward the basics and gives us an important window into proportions, lines, etc. without obscuring those features with much ornament. There are no issues to be had with ornament (used appropriately) as such; its just that its absence in Shaker furniture helps the eye to see and comprehend the essentials more clearly. Their furniture was fully functional, always fulfilling its intended purpose. There was a slowness, stillness, and quietness that gave their work an unexpected majesty. The Shakers understood the essentials very well. 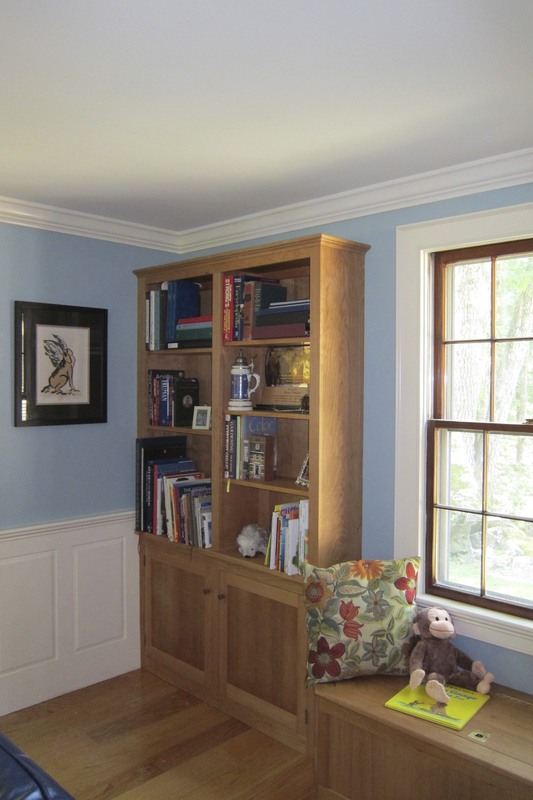 Those same essentials are important to all furniture design whether Shaker in style or not. It is important to get the essentials correct; once that is done, additional work can be done to fully develop a piece in ways that are fresh and new without sacrificing functionality or by adding so much detail that the essentials become lost. Details Matter – they matter in the natural world around us, and they matter in the things we make. 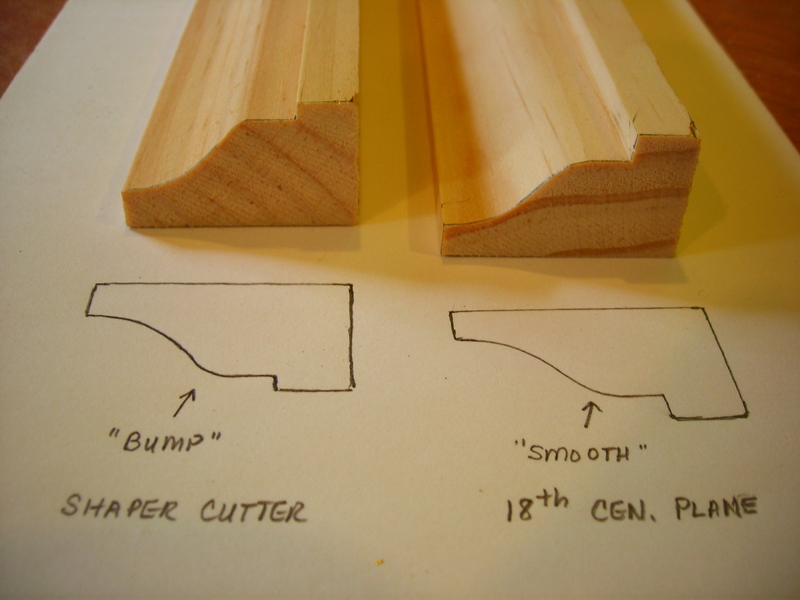 Molding profiles are a good example. Recently I’ve been experimenting with some antique molding planes; some are are termed “complex” because they combine two or more basic shapes to create an entire profile, while others are termed “hollows and rounds” and create only simple convex or concave profiles. The hollows and rounds can be used in conjunction to make more complex moldings. Most of my antique planes were purchased for about $10-20 each years ago and have proved useful from time to time, especially when I didn’t have (or didn’t wish to purchase) a particular router bit or shaper cutter. I have only one 18th century plane and I considered it to be a good deal at $65 about 20 years ago partly because it was dated so early, but mostly because it created a beautiful ogee profile that happened to match one that was to be used in a house my wife and I were building at the time. This house required literally thousands of feet of this molding, and for practical reasons most of it was produced by a standard shaper cutter, but the 18th century plane was used to create the molding in a few special places such as the fireplace surrounds. The 18th century plane makes a nice smooth transition from concave to convex while the shaper cutter creates more of a “bump” rather than a convex surface. The smooth transition is pleasing to the eye and has a sort of relaxed feeling. In contrast the “bump” transition is kind of abrupt and not especially pleasing. The difference between these two profiles at the maximum point of difference is only about 3/32 of an inch, but the visual difference is far greater. The “industrial” shape of many cutter heads or router bits tends to be determined by practical matters such as relief angles, fragility of carbide edges, etc. whereas the profiles of the older hand molding planes were determined solely by the beauty of their curves. I’ve often wanted to re-grind this shaper cutter head so it would be more like the molding plane profile, but unfortunately the cutter head needs more, not less, steel at the transition point. Good furniture deserves care in creating the molding profiles. Most of the profiles on my furniture are designed and scaled specifically for that piece. Sometimes industrial cutter heads or router bits are able to produce the desired profile (and perhaps save time if more than a few feet of molding are required), but I think molding planes (even just a quarter set of hollows and rounds) allow for much more creativity and flexibility. Up until a few years ago, it was relatively easy to find matched pairs of hollows and rounds locally, but my two favorite antique stores (with woodworking tools) are no longer in business. After much searching on eBay and other internet sites without much success, I recently decided that it would make the most sense to make a quarter set of hollows and rounds (1/8″, 1/4″, 3/8″, and 1/2″ – commonly numbered as #2, 4, 6, and 8). Many years ago I made a couple small beading planes by attempting to copy some existing planes with larger profiles. They were fitted with reshaped antique irons (which could often be found at flea markets) and were functional, but hardly in the same class as the originals. 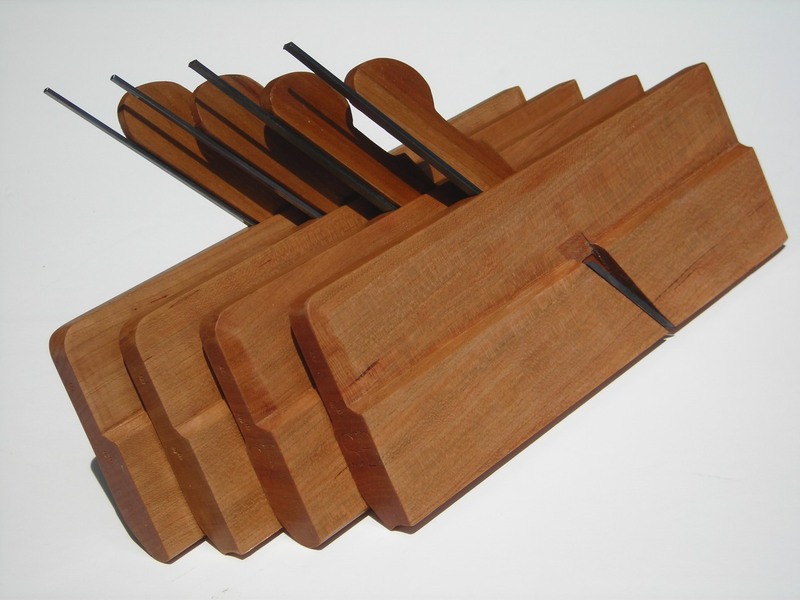 Fortunately today many more resources are available for making (or buying) molding planes. 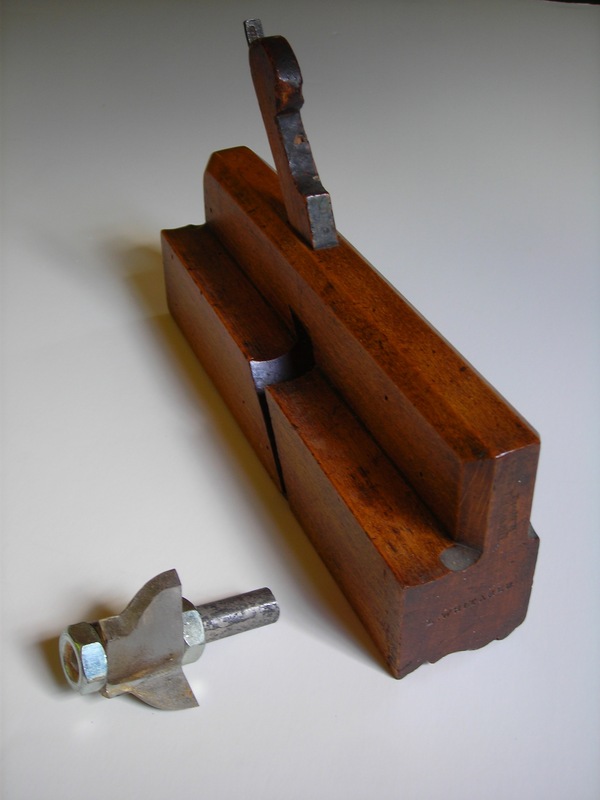 The Lie-Nielsen produced “Making Traditional Side Escapement Planes” by plane maker Larry Williams (Old Street Tools) is an incredible resource. Matt Bickford also has some very useful information (e.g. rabbet planes) on his website (MSBickford.com), and also has planes available for sale. High quality tapered plane irons are now available from Lie-Nielsen Toolworks. I’m looking forward to making the #2 and 4 pairs in the near future and using this set of hollows and rounds on my next piece of furniture. For anyone awaiting the next “design” post, I’m working on it, but reducing Christopher Alexanders concept of “Centers” and their “15 Properties” to blog size is a daunting task and I want to do it right because I think he has captured the essence of good design in his writings. 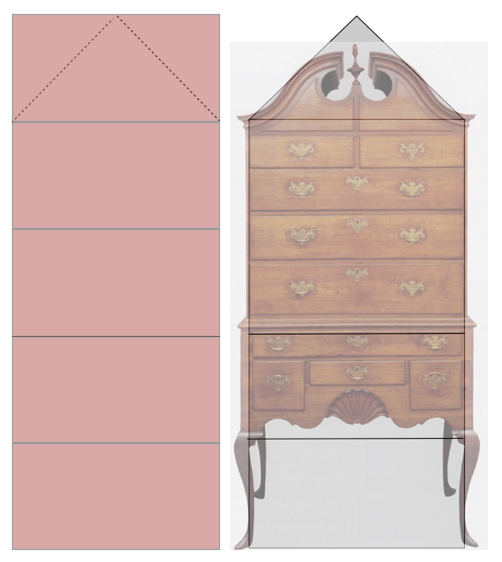 In my last post I noted how a complex piece of furniture like a traditional highboy is often composed of shapes that are relatively simple (like a 1:2 rectangle.) After reflecting on this piece a bit further, I realized that there is a more elemental 1:2 rectangle that forms the basis for this piece. 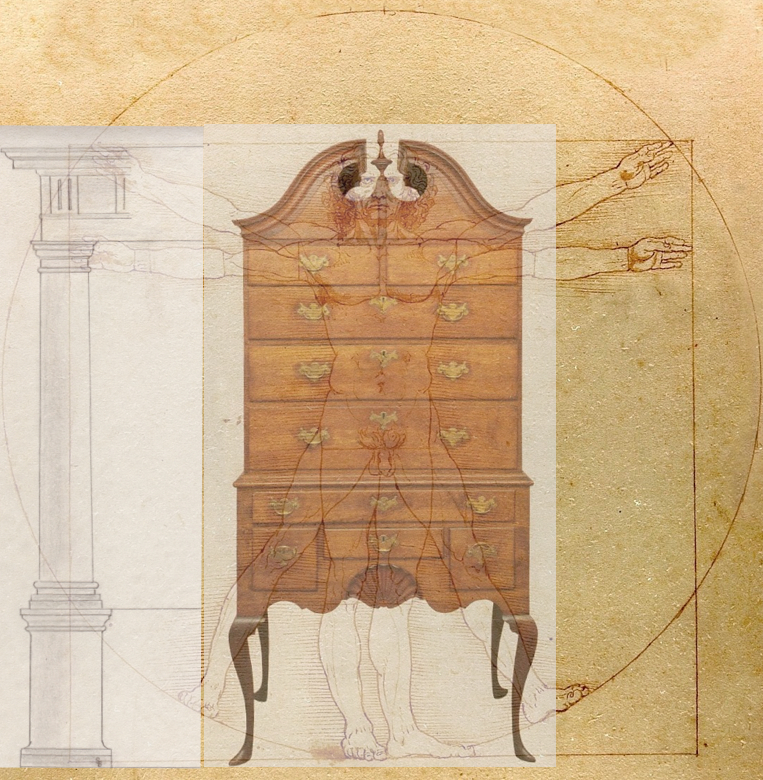 It is the rectangle that encompasses the legs at the base of the highboy. The remainder of the piece is essentially “un-folded” up from the base with a series of equally sized rectangles. The first two make the base (or lowboy) portion; the next two make the top (which creates a “country style” highboy); the final “un-folding” up is in the form of a triangle (essentially half of the rectangle) that creates the bonnet (and a more refined highboy). This seemingly complex piece receives its final overall shape in just 4 simple un-foldings of a 1:2 rectangle. It should not come as a complete surprise that next level of detail (which consists mostly of the drawers) can be “un-folded” in a similar manner. Because it is tedious to show the details step by step, I will show just one final sketch and make a few observations. First, the shape of the legs is contained within a series of 4 squares (think of the leg as “growing” up from the floor in four equal increments). Second, all of the drawers appear to “un-fold” from just one basic rectangle (the one that outlines the top drawer of the base section.) The drawers below it “un-fold” from rectangles that are 1/4 the length of this basic rectangle. Third, and amazingly, even the graduated drawers that make up the top section follow this basic rectangle (although their graduation, of course, precludes a precise match.) It is also worth noting that the bonnet (which touches the edges of the upper triangle, but does not fill to the top) has its actual height set at three basic rectangles high. I’ve not considered the curves beyond noting that the diameter of the upper circular openings and the radius of the lower shell carving appear to be very close to the height of the basic drawer rectangle. They are in a 1:2 relationship with each other. 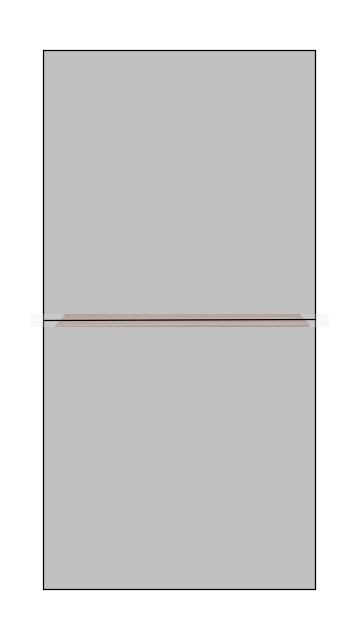 Furthermore, the curves on either side of the shell appear to have a radius more or less equal to half the height of the basic drawer rectangle. Step 1: The bottom rectangle with the legs creates a “center” that consists mostly of empty space. The “empty” space is developed into a rich visual field by the curves in the legs. Step 2: The rectangle above the legs creates another “center” that re-enforces and further develops the bottom rectangle. The drawers and especially the curves of the shell and adjacent areas reinforce and complete the curves in the legs making another visually rich field. Note how each curve simply flows into the other curves. Steps 3 and 4: The two rectangles above the base form another “center” and re-enforce the base by completing it and creating an upward movement. The graduation of the drawers serves to further intensify the sense of upward movement. The drawers create a simple, yet visually rich field. Step 5: The top rectangle (now a triangle) becomes another “center” that reinforces the whole piece by crowning it. The curves in the bonnet and base echo and re-inforce each other. The entire piece comes alive as all of these “centers” and their visual fields interact with each other. The remarkable unity of this piece arises from the fact that each center is created by the consistent “un-folding” that flows from a single initial 1:2 rectangle. It is as if the entire piece “grew” from just that initial rectangle. Its structure is “organic” (although hardly in the “hippie” sense of organic which tends to avoid any semblance of structure.) 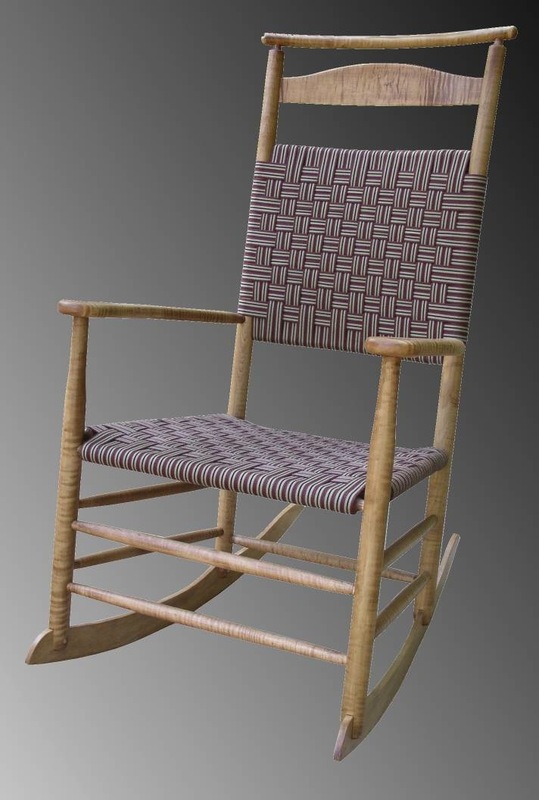 Instead, the organic structure that emerges almost effortlessly in the highboy is similar to the structures that are deeply embedded in the natural (organic) world around us. 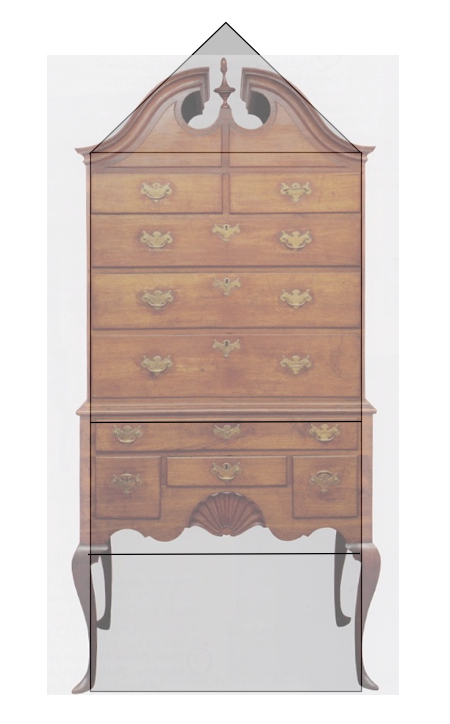 The highboy, though man-made, is very closely related to the natural world that surrounds us. It is not surprising that we feel “at home” in the presence of a piece like this. As noted in my previous post, it is also deeply “human” in scale. 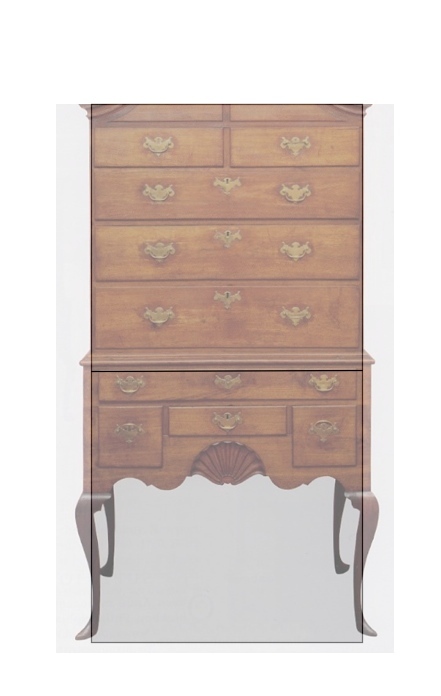 One final note: while a significant part of the beauty and depth of this highboy comes from the consistent un-folding process, some of its interest (especially in the details) comes from the fact that (like nature) it does not unfold with complete or mechanical precision. The slight variations (like the graduated drawers) serve only to further intensify each center and ultimately they intensify the whole piece. The concept of “centers” and how they “unfold” to create a “whole” comes in large part from architect Christopher Alexander’s four volume series titled “The Nature of Order.” Alexander explores these concepts in great depth that is simultaneously highly theoretical and immediately practical. I highly recommend his work to anyone who is interested in exploring good design. Alexander has observed 15 qualities that work together to create centers. I hope to explore these 15 properties and their relationship to furniture design in a future post. Good Shapes, Good Proportions, Good Design. 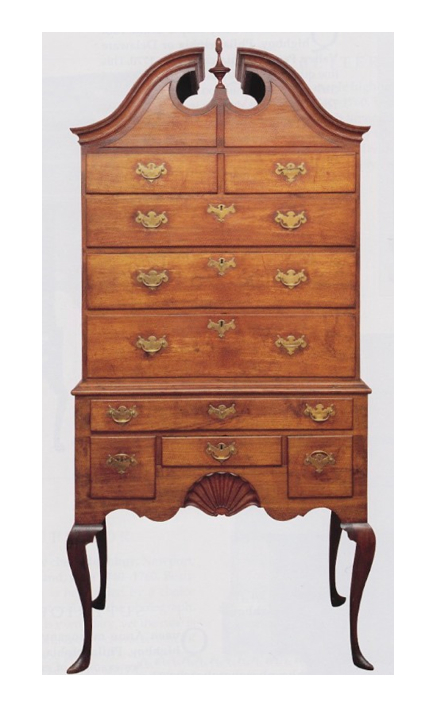 Recently, I’ve spend some time looking at various pieces of furniture that are acknowledged to be “Masterpieces.” One of the pieces I have looked at is a traditional Townsend-Goddard Queen Anne Highboy probably dating to about 1750. I have never built a piece like this, but if I were to build one like it, I would want to sure that my own design would be very good because the investment of time and materials would be substantial. As I have looked at this piece, I have observed some things like the fact that the height of the bottom drawers on both the base and top are the same, or that the curve in the cabriole legs is much closer in shape to the curve in the bonnet than a first glance might suggest. The height of the bonnet is very close to the the combined height of the top two drawers. It is probably not a coincidence that the combined height of the drawers in the base is also equal to the height of the bonnet, or that the height of the small center drawer in the base is equal to the height of the drawer above it. All these are just a small sampling of literally dozens of relationships that can be found – some obvious, some much less so. So how did the original builder arrive at all these sizes, shapes, and proportions? And how might I arrive at them (or similar ones, assuming that I’m not interested in making a copy)? I think the first step in getting a piece of furniture “right” is to make sure that the overall shape and proportions are right. As I noted above, if these are not right, the details that follow probably won’t be right either. Fortunately, I think the general process for arriving at the overall shape and proportions is not nearly as difficult as it might seem. For the moment, I would like to focus on just the overall shape of this piece. Think in terms of looking at it from a distance – say from across the room – far enough away that the finer details remain irrelevant because you can’t see them yet. I have found it instructive to “reverse-design” this piece as a means of grasping how the original builder might have arrived at the overall shape, proportions, and major divisions. Having “reverse-designed” this piece, here is the process by which I think the original builder might have sketched out the original design. It is clear the the intent of the builder was to make something that was relatively tall (as opposed to long and low.) Selection of this very general shape was perhaps based on the space into which the piece would be placed, or perhaps the overall shape was based on the intended use. With this in mind, begin with a tall rectangle with a 1:2 ratio – what could be more simple for a tall, but not exaggerated, shape? 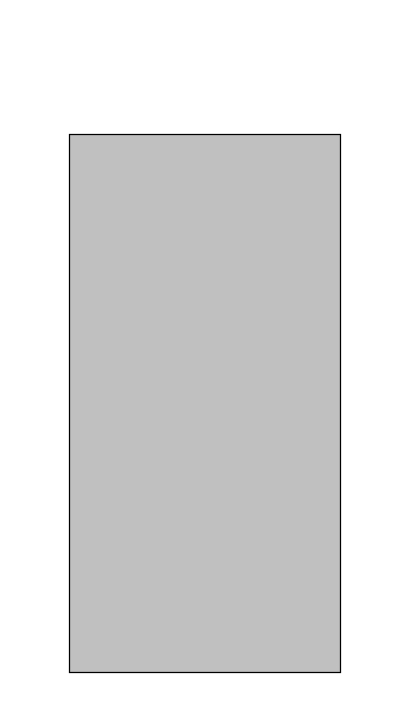 Having divided the 1:2 rectangle into a top and bottom, now do the same to the bottom rectangle dividing it in half horizontally (just like the original 1:2 was divided in half horizontally) letting the bottom half become the space for the legs and the top half a space for some drawers. 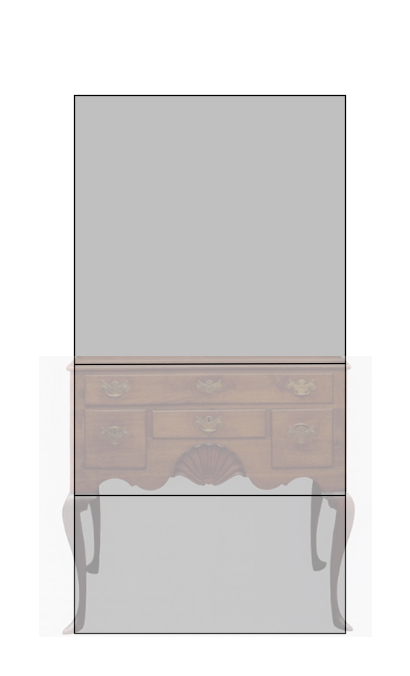 At this point the bottom half is essentially a lowboy with generally pleasing proportions, but let’s continue on to create a highboy by filling in the top rectangle. One could stop here (and the overall shape would be very close to that of many “country” highboys), but I suspect that the builder (or his client?) desired something a little more elegant. To achieve this elegance in a tall piece it would make sense to add something not unlike a roof to cap it off. So, with this in mind, add a triangle at the top, but not just any triangle. To be consistent with the previous sub-divisions, make the height of the triangle equal to half of the section above the “shelf” (or ¼ of the original 1:2 rectangle.) 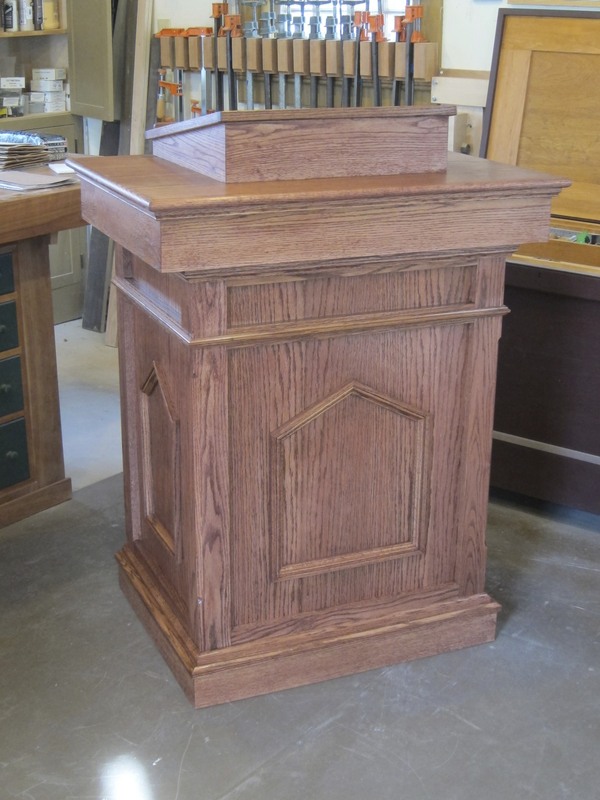 Think of it as almost being “unfolded” upward from the top half of the top section – as if it were just hinged along the top edge of the “country” highboy and “opened” upward like a door on a hinge. At this point it is worth stopping to note that our builder is following a process that almost always involves the sub–division of an existing space in order to create the next space. There is much more that could be said about the details, but I’ll note just one observation: the measured height of this piece would not be precisely equal to the height of the shapes themselves because the details of the bonnet touch the edges of the triangle though no detail actually reaches the peak. The shapes are not “slavish” in nature nor in this piece; they only require that their background presence be acknowledged in a meaningful way. Having arrived at the overall shape and major sub-divisions for this piece, I think the very same process exactly would have been applied to each major subdivision as each one was in turn fully developed. This “re-application” of the process to each major sub-division would result in the emergence of the details (like the graduated drawers) that would be seen from a closer perspective – perhaps from half-way across the room. A further “re-application” would develop the finest details (like the carvings or finial) which would only be fully appreciated from a very close perspective. There is much more to say (in a future post), but remember that the process which moves from a simple shape to the overall shape of finished piece and its major sub-divisions is not too difficult to grasp. Start with a shape appropriate to the intended purpose of the piece, and step-by-step “unfold” the rest of the major divisions using only simple whole number proportions taking care not to be too exacting. After all, nothing in nature is that exacting either!